Exactly what you've been imagining for months, only brighter, bluer and possibly breezier. With BBQ stations this nice, you'll need a seriously convincing excuse to go out to dinner. Knock it out first thing, while the rest of your crew is still lost in dreamland. Enjoy the ocean views from every angle possible. You spent the whole day there, and the kids are already talking about tomorrow's pool adventures. Located on beautiful Kaanapali Beach. Your kids will love the children's pool and children's club. When it's time to come inside, check out the DVD library! You're just a 3 minute walk to Kaanapali Golf Course Resort South. You're surrounded by lush palm trees, white-sand beaches and tropical plant life. Once you’ve arrived, first things first. Kick off your shoes and head straight for that soft, white Kaanapali Beach sand. Situated oceanfront on the three-mile stretch that’s been named “America’s Best Beach,” the Kaanapali Alii has photo-worthy views that just don’t quit. Enjoy a relaxing stroll through the beautiful grounds with palm trees and tropical plants on your way to the outdoor pools. There’s a family pool, an adult pool, and a children’s pool. Go for a swim or set up camp in a lounge chair and keep an eye on the kids. When the “What’s for lunch?” questions start coming, be a hero and fire up the bbq grills. Or take advantage of the poolside food service. Let the kids hang out in the seasonal on-site free children’s club while you get in a workout at the fitness center. Or line up tennis lessons with the on-site pro, then recover from all that hard work with a few signature treatments at the on-site spa. Individually decorated, air-conditioned one- and two-bedroom condos sleep four to six guests and have more than enough space for the mind-blowing amount of pillow pets and pool toys the kids brought along. Free DVD rentals and a full kitchen for popcorn-popping and ice cream scooping make movie night on the cable TV with DVD player a slam dunk. Times Supermarket and Farmers Market Maui are nearby, take a family field trip to grab groceries. In-suite washer/dryers allow you to pack light and save extra space in your suitcase for souvenirs. Views include mountain, garden, ocean, or partial ocean. Any golfers in your party? Good news! 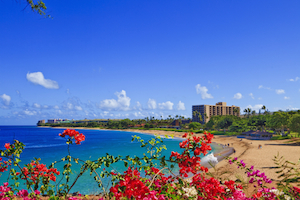 The resort is just across the street from the Royal Kaanapali Golf Course. This eighteen-hole, par 71 course was designed by Robert Trent Jones Senior in 1962. It underwent a thirteen-million-dollar renovation between 2006 and 2007. The course has hosted several golf legends including Arnold Palmer, Billy Casper, Nancy Lopez, and Jan Stephenson. Whalers Village is an outdoor shopping mall that has everything you need to start filling that extra space in your suitcase. Get your caffeine fix at Island Vintage Coffee. Treat yourself to a new piece of jewelry from Alex and Ani or Pandora. Browse the selection of shades at Sunglass Hut from brands like Armani, Coach, Gucci, and Prada. For apparel, there’s Tommy Bahama, Billabong, Lululemon, and Quicksilver. When you’re ready for lunch, check out Hula Grill, Leilani’s on the Beach or Joey’s Kitchen. If you’re up for an adrenaline rush, Skyline Eco Adventures, Hawaii’s number one zipline company, has you covered. Experience an eight-line or an eleven-line ultimate adventure tour.